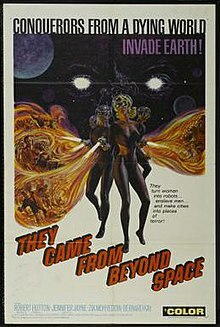 They Came from Beyond Space is a 1967 British Eastman Color science fiction film directed by Freddie Francis, written by Milton Subotsky and based on the book The Gods Hate Kansas by Joseph Millard. It was produced by Amicus Productions. The production came after Daleks – Invasion Earth: 2150 A.D. (1966) and used many of the sets and props from the former film as a cost-cutting measure. Several meteors fall in a field in England. Those who approach them are seemingly taken over, and barricade the area from intruders. A scientist is immune to the takeover due to a metal plate in his head. He enlists the assistance of a friend, who must melt down his silver cricket trophies to make a helmet to protect him. Although initially claiming that the takeover is benign, the aliens attempt to remove the metal plate from the scientist but are thwarted and learn the human value of courtesy. In the book, Doctor Temple is captured and the alien leader successfully removes his protective metal plate. The ensuing struggle between the two resembles something more like the Star Trek TOS episode "The Lights of Zetar" or The Exorcist than the kung fu commando battle in the movie. The book also gives us a look at the aliens as they might have been had their ancestors made different choices in the development of their culture. The contrast of the two alternative types of alien is similar to the contrast of the "invading women" daymare with the actual riim creatures of A. E. van Vogt's Voyage of the Space Beagle. The film was released on a double feature with The Terrornauts. Director Freddie Francis says that the producers had spent all their budget on The Terrornauts so there was no money left over for They Came from Beyond Space. The double feature failed at the box office and has been described as "the two worst films the company ever produced". This page was last edited on 19 May 2018, at 11:35 (UTC).